what a gorgeous hue of purple - I love it! What a great picture! 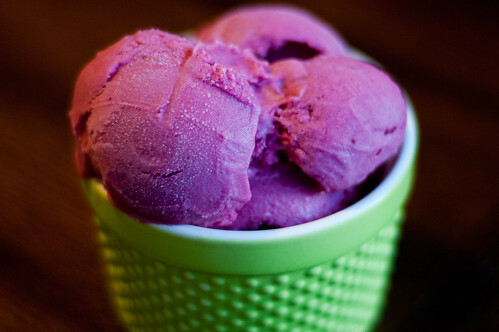 i'd never thought of plum ice cream.. does it really taste good? Looks absolutely perfect and delicious :) Love the deep color too. I finally broke down and bought this cookbook today. I've been looking through it all afternoon to try to figure out what to try first. This ice cream looks awesome. I love the color! Oh how I love purple and green. such a beautiful combo! I love the look of this icecream and I love plums. Even though it's winter here I'm tempted to make it. beautiful ice cream. The colour is so beautiful. I need to make. Must be very delicious. A healthier ice cream with fruits. Thanks very much for sharing. Hi! I'm a long time reader, first time follower of your lovely blog (as I'm quite new to blogging). I've made this lovely recipe and uploaded it on my blog. I've referenced your blog also, hope that's OK! Love your recipes! I know you posted this a while back, but I just made it and OMG is it delicious. I love the sweet and tart together. I think it's my new favorite! I'm also glad you suggested straining the skins off because I love it being so smooth and creamy!